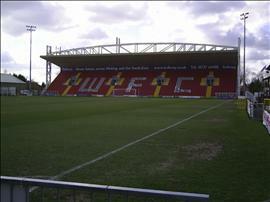 This venue is situated in Woking. The nearest mainline station is Woking. Please be aware that this access guide was surveyed on a ‘non-match’ day, and that disabled supporters have advised us that on a busy match day/night the access experience can vary. We would encourage you to fully research this with the club concerned before attending a fixture. If you require further information or would like to know more please visitThe National Association of Disabled Supporters (NADS)website at:. NADS is the national registered charity which represents the views, issues and concerns of disabled football supporters to football and governmental authorities and provides independent advice on disability issues as they affect the football, cricket and rugby communities. Their key objectives are to promote an inclusive agenda, raise disability awareness through sport and ensure an equality of experience for all fans. The dimensions of the designated parking bay(s) are 300cm x 487cm (9ft 10in x 15ft 12in). The nearest designated bay is 8m (26ft 3in) from the Westfield Avenue entrance. The furthest designated bay is 16m (17yd) from the Westfield Avenue entrance. Parking is free on non-match days. An annual fee must be paid to park on match days. You are on Outside Access (Westfield Avenue). Skip to the next section. You are on Level Change (Westfield Avenue). Skip to the next section. The ramp or slope is located in front of the gates. The photograph shows the drop of point outside the main entrance. The gates will be opened to allow access for wheelchair users. You are on Sports Ground. Skip to the next section. Wheelchair seating is located in the Leslie Gosling Stand and the stand behind. Wheelchair users do not have a designated accessible seating area. There is only seating for wheelchair users in the home areas of the stadium. Away fans can also use this seating. The accessible toilet is 37m (40yd) from the accessible entrance. The accessible toilet is located underneath the main stand. The dimensions of the accessible toilet are 182cm x 260cm (5ft 12in x 8ft 6in). The female toilets are located under the Leslie Gosling Stand. The female toilets are 34m (37yd) from the accessible entrance. The male toilets are located under the Leslie Gosling Stand. The male toilets are 34m (37yd) from the accessible entrance.